I have a monthly time series with an intervention and I would like to quantify the effect of this intervention on the outcome. I realize the series is rather short and the effect is not yet concluded. 1) The pre-intervention series (up until October 2013) was used with the auto.arima function. The model suggested was ARIMA(1,0,0) with non-zero mean. The ACF plot looked good. 1) Is this methodology correct for intervention analysis? 2) Can I look at estimate/SE for the components of the transfer function and say that the effect of the intervention was significant? 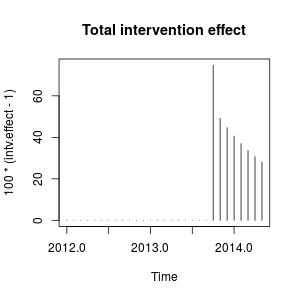 4) Is there a way to estimate how much the intervention increased the output after 'x' months? I guess for this (and maybe #3) I am asking how to work with an equation of the model - if this were simple linear regression with dummy variables (for example) I could run scenarios with and without the intervention and measure the impact - but I am just unsure how to work this this type of model. Per request, here are the residuals from the two parametrizations. You can test the significance of each intervention by looking at the t-statistic of the coefficients $\omega_0$ and $\omega_1$. For convenience, you can use the function coeftest. In this case the pulse is not significant at the $5\%$ significance level. Its effect may be already captured by the transitory change. The effect is relatively persistent because $\omega_2$ is close to $1$ (if $\omega_2$ were equal to $1$ we would observe a permanent level shift). 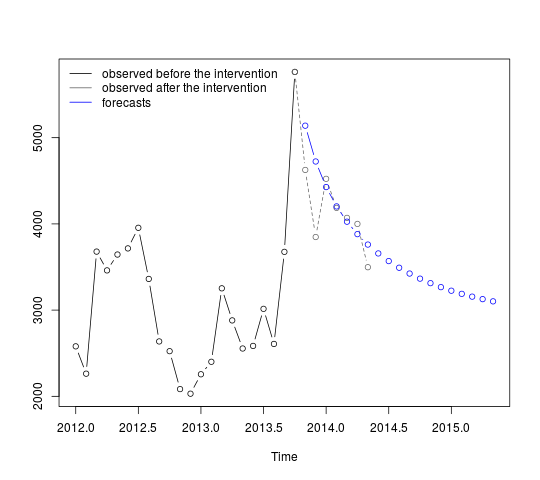 The intervention increases the value of the observed variable in October 2013 by around a $75\%$. In subsequent periods the effect remains but with a decreasing weight. We could also create the interventions by hand and pass them to stats::arima as external regressors. The interventions are a pulse plus a transitory change with parameter $0.9231$ and can be built as follows. The same estimates of the coefficients as above are obtained. Here we fixed $\omega_2$ to $0.9231$. The matrix xreg is the kind of dummy variable that you may need to try different scenarios. You could also set different values for $\omega_2$ and compare its effect. and it can be specified as you did using transfer=list(c(1, 1)). 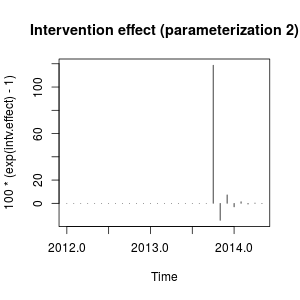 As shown below, this parameterization leads, in this case, to parameter estimates that involve a different effect compared to the previous parameterization. It reminds me the effect of an innovational outlier rather than a pulse plus a transitory change. The effect can be described now as a sharp increase in October 2013 followed by a decrease in the opposite direction; then the effect of the intervention vanishes quickly alternating positive and negative effects of decaying weight. This effect is somewhat peculiar but may be possible in real data. At this point I would look at the context of your data and the events that may have affected the data. For example, has there been a policy change, marketing campaign, discovery,... that may explain the intervention in October 2013. If so, is it more sensible that this event has an effect on the data as described before or as we found with the initial parameterization? According to the AIC, the initial model would be preferred because it is lower ($-18.94$ against $-15.42$). 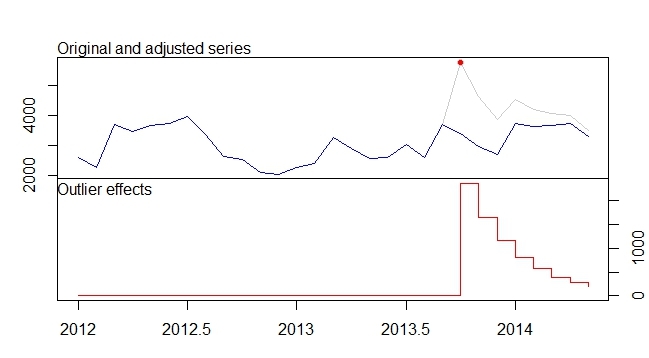 The plot of the original series does not suggest a clear match with the sharp changes involved in the measurement of the second intervention variable. Without knowing the context of the data, I would say that an AR(1) model with a transitory change with parameter $0.9$ would be appropriate to model the data and measure the intervention. The value of $\omega_2$ determines how fast the effect of the intervention decays to zero, so that's the key parameter in the model. We can inspect this by fitting the model for a range of values of $\omega_2$. Below, the AIC is stored for each of these models. 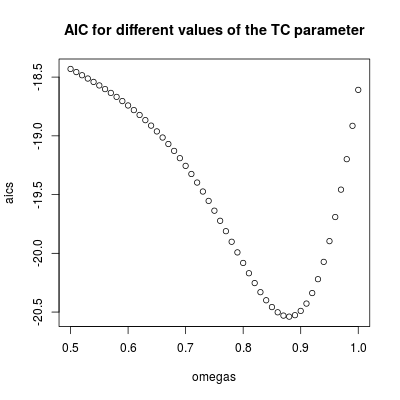 The lowest AIC is found for $\omega_2 = 0.88$ (in agreement with the value estimated before). This parameter involves a relatively persistent but transitory effect. We can conclude that the effect is temporary since with values higher than $0.9$ the AIC increases (remember that in the limit, $\omega_2=1$, the intervention becomes a permanent level shift). The intervention should be included in the forecasts. Obtaining forecasts for periods that have already been observed is a helpful exercise to assess the performance of the forecasts. The code below assumes that the series ends in October 2013. 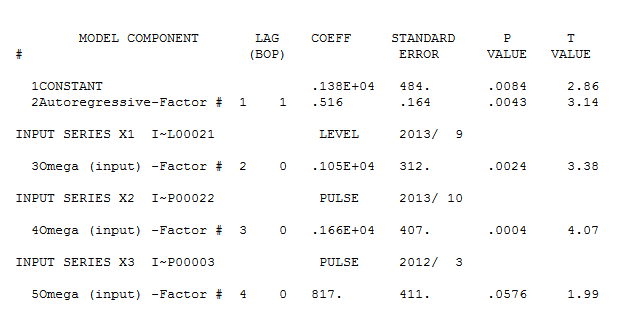 Forecasts are then obtained including the intervention with parameter $\omega_2=0.9$. The first forecasts match relatively well the observed values (gray dotted line). 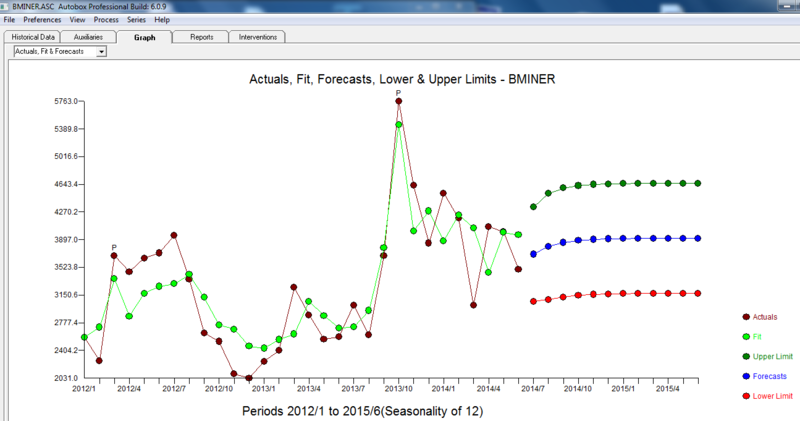 The remaining forecasts show how the series will continue the path to the original mean. The confidence intervals are nonetheless large, reflecting the uncertainty. We should therefore be cautions and revise the model as new data are recorded. Sometimes less is more. With 30 observations in hand I submitted the data to AUTOBOX , a piece of software that I have helped develop. I submit the following analysis in the hope of acquiring the +200 reward (just kidding !) . 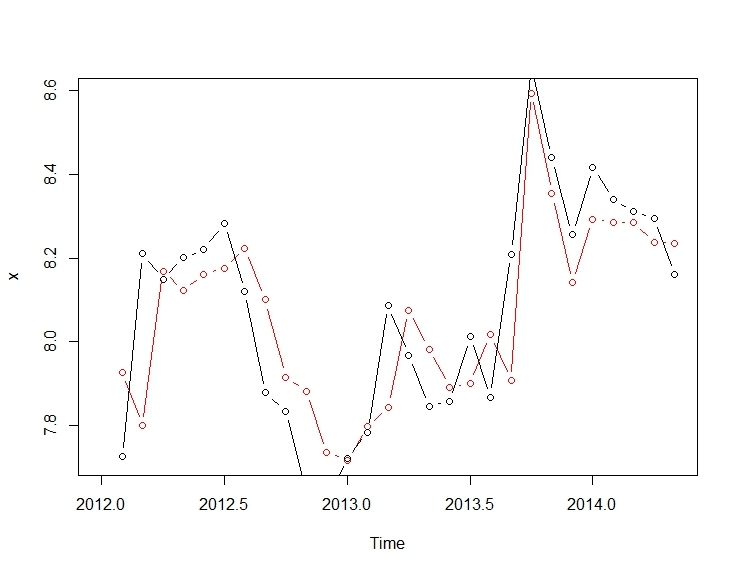 I have plotted the Actual and Cleansed Values a visually suggesting the impact of "recent activity". . The model that was automatically developed is shown here. and here . The residuals from this rather simple level-shifted series are presented here . The model statistics are here . In summary there were an interventions that could be empirically identified rendering an ARIMA process ; two pulses and 1 level shift . The Actual/Fit and Forecast graph further highlights the analysis. I for one would like to see the plot of the residuals from the previously specified and in my opinion potentially overly-specified models. 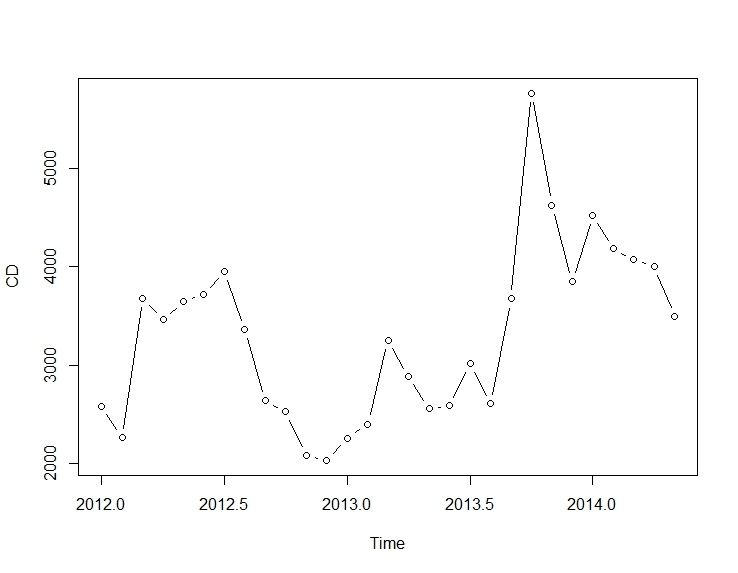 Based on my similar post to your earlier question, I used tso function in tsoutliers package in $R$ and it automatically detected a temporary change at October 2013. Please note that temporary change is different from ramp shift in transfer function which is what you are after. I don't think there is a package/function that I'm aware of that would be able to visualize transfer function. Hopefully this would provide some insights. I did not use log transformation, I modeled it directly. tsoutliers package can be thought of as an automatic intervention detection. Below is the estimate, there was a ~2356.3 unit increase in October 2013 with a standard error of ~481.8 and has a decaying effect thereafter. The function automatically identified AR(1). I had to do couple of iteration and make both seasonal and non seasonal differencing to 0, which is reflected in the args.tsmethod in the tso function. 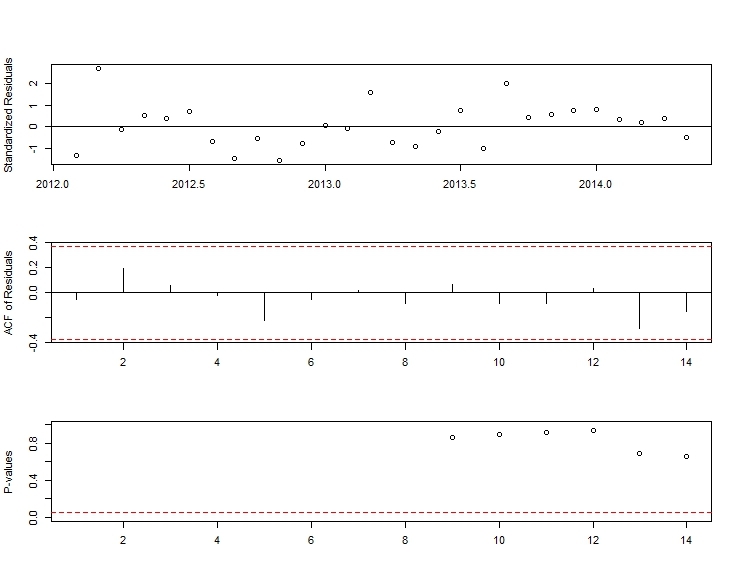 Below is the plot, tsoutlier is the only package that I know of that can print temporary changes this nicely in a plot. This analysis hopefully provided answer to your 2, 3 and 4 questions albeit using a different methdeology. Especially the plot and the coefficients provided the effect of this intervention and what would have happened if you did not have this intervention. 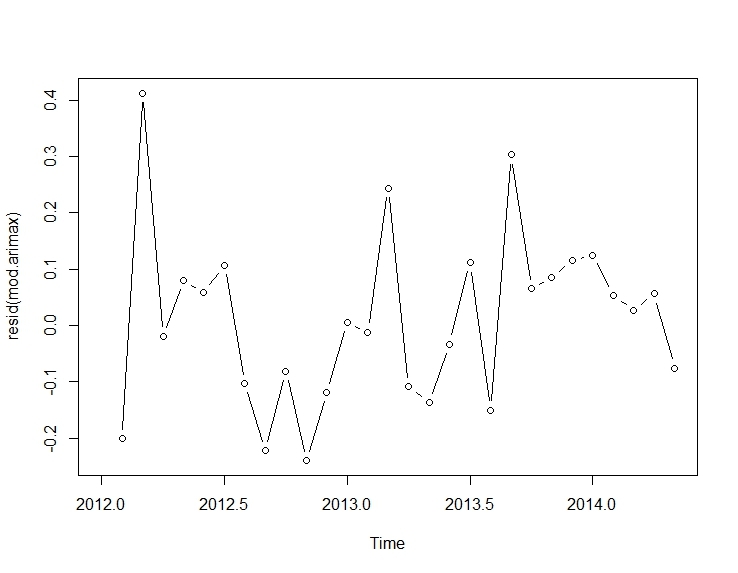 Also hoping someone else can replicate this plot/analysis using transfer function modeling in R. I'm not sure if this could be done in R, may be someone else can fact check me on this. Not the answer you're looking for? 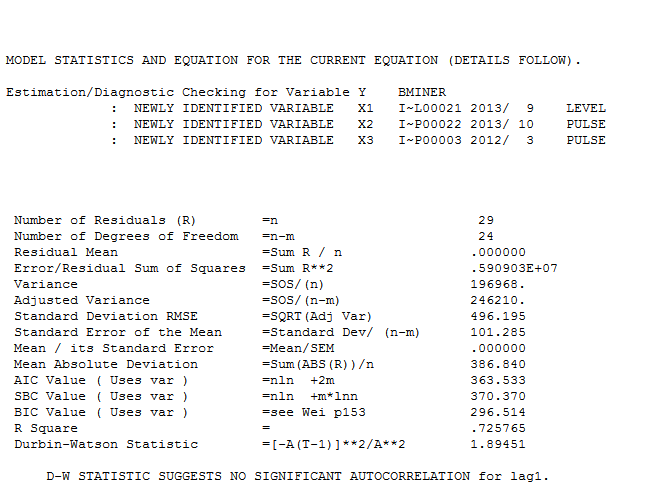 Browse other questions tagged r regression arima intervention-analysis or ask your own question. 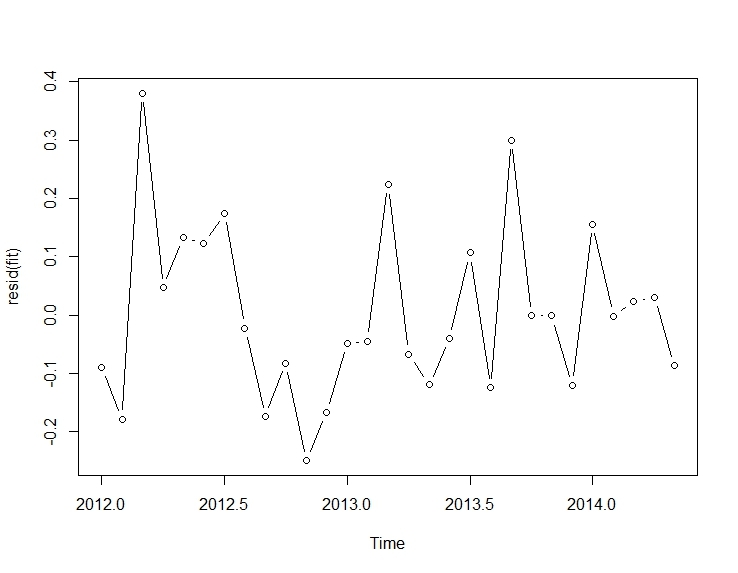 Can I use ARIMA to model non-Gaussian time series? 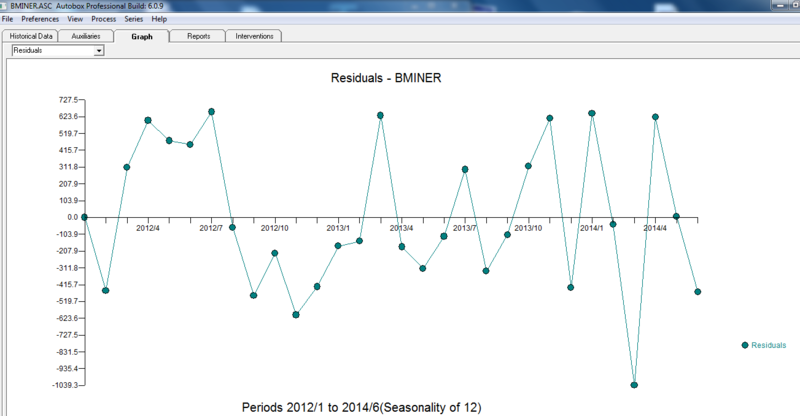 How to include control variables in an Intervention analysis with ARIMA?